Carbon price policies deliver cost-efficient mitigation across sectors, but can result in tradeoffs with food security and other sustainable development goals. Scenarios for a 1.5 °C world based on carbon prices could increase the undernourished population by 80 - 300 million in 2050. Applying a uniform carbon price across geographic regions and economic sectors has inequitable effects on countries’ agricultural competitiveness and food availability. Under higher carbon prices, regions with poor productivity – and consequently higher GHG emissions per unit of output – would experience increased agricultural commodity prices. Frank S, Havlík P, Valin H, Wollenberg E, Hasegawa T, Obersteiner M. 2017. 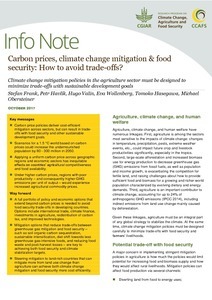 Carbon prices, climate change mitigation & food security: How to avoid trade-offs? CCAFS Info Note. Wageningen, Netherlands: CGIAR Research Program on Climate Change, Agriculture and Food Security (CCAFS).